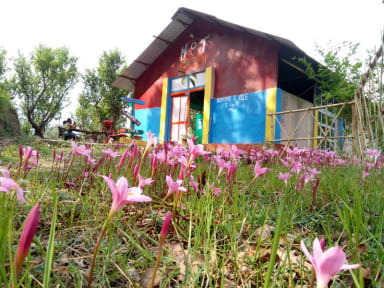 HOTs hostel Jeolikote is India's first Hiking hostel. It makes you believe and realize that in life what is important is not how many breaths we take...but, what takes our breath away. Hots hostel is surrounded by valley and located in mid of jungle, which means one has to hike uphill and down hill both for 670 meters to reach the property which is a highly pleasurable and invigorating exercise . Not to mention the amazing scenic beauty you take in on the way. 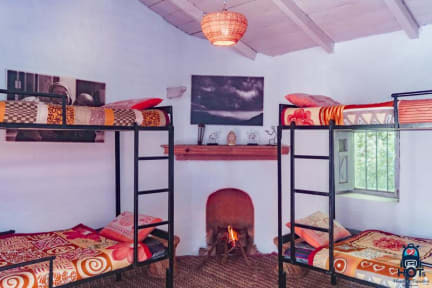 Hostel is established in 150 years old British era colonial houses in area of 1 square feet. For all foodies out there we have a cafe where you will get to taste some mouthwatering homemade food by our local village staff. How many properties have you seen with an in-house Waterfall? Well, HoT hostel has got one. Tucked away in a quiet corner of the lower himalayas, the setting couldn't have been more beautiful. The atmosphere and the hosts make sure that your time is well spent the way you wish. You'll come back richer with some new friends. There is a small hike of about 40 minutes that leads you to temple with some grand views of the valley below. The place is well worth multiple visits! The best place for being with self. Shorya is amazing who helped in every single way to make your visit more memorable. Humble staff and good weather. What else is needed! Just the fear of leopards makes it more adventurous! City dwellers, if you ever get a feel to settle in the mountains, then this is the place to look forward to. Nested in middle of a jungle, a 20mins walk disconnects you from the rest of the world. If in middle of mountains, a 150 year old Brit-era building, a small water stream nearby is not enough to make your stay worthwhile, then you also have a HOTS cafe. Stayed here for only 1 night (9th Sep), and it was completely worth it and I am already thinking of going back again for a longer period. It's beautiful and amazing, we planned to stay for 1 day, ended up staying there for 5, just imagine the the facilities and atmosphere of the place, it binds you in, and you're enticed to stay longer. The pet Shanti, she's the most happy companion, she goes for walks with you, helps you smile and everything. Must stay. Genuine place of beauty, stunning views, magical atmosphere. Harshit, amit and vivek are very hospitable, open and engaged people who made our stay a very memorable experience. They are an easy going, admirable group who implicitly live by a philosophy to share culture, knowledge and experience without a price tag. Best of luck for the future! !